This problem makes me think about how voting districts are apportioned, and how we can use algorithms to solve real-world situations like gerrymandering. The problem: Bounded Component Spanning Forest. This is problem ND10 in the appendix. 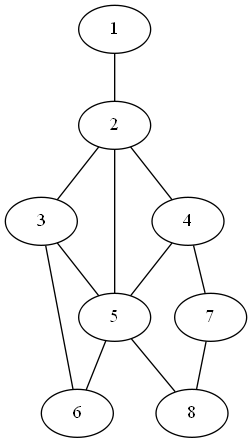 The description: Given a graph G=(V,E) where each vertex has a non-negative weight, and two integers K and B, can we partition the vertices of V into K (or less) disjoint subsets where each subset is connected and the sum of the weights of the vertices in each subset is at most B? Example: Here’s a graph where each vertex is labeled with its weight. Note that in this example, the edge weights are distinct and sequential, and that doesn’t have to be the case. Note: Here’s how this applies to the voting problem I alluded to above. Each congressional district is made up of several “precincts”- local areas that have a smallish number of people. The boundaries of each congressional district is a connected group of wards. So, for example, I’m part of Ohio’s 12th congressional district, but even within the relatively small town I live in, there are at least 3 different precincts, and I have a specific one assigned to me. We could apply the Bounded Component Spanning Forest problem to this situation by creating a graph, where each vertex in the graph represents a precinct and has a weight equivalent to the number of people living in that precinct. Two precincts have an edge between them if they’re geographically adjacent. We can be given a list of all of the precincts in the state, and then K would be the number of congressional districts to form. B would be a bound on how large (in terms of number of people) each district can be (or, how far from 1/Kth of the population each district can be). This works in creating congressional districts, and, as we’ll see, is already NP-Complete, even before thinking about gerrymandering. The only requirement so far is that each district has to be contiguous- nothing has yet been said about the shape. But a natural definition of “non-gerrymandered” could be “minimum diameter”, and so we can add a new parameter, D, to the problem, and force each of the K subsets of vertices to not only be connected, but be connected with diameter D or less. Since this is a generalization of the original problem, this is also NP-Complete (by a difficulty 1 reduction). So, there you go. Fixing gerrymandering (at least by this definition) is NP-Complete. Since most states have hundreds (perhaps more- it’s remarkably non-trivial to find a simple answer to “how many precincts are in Ohio”) of precincts, the best we could likely do is some heuristic mechanism, and of course, any heuristic has a chance of being suboptimal against one party or another, and so they will never accept it. Sigh. Anyway, back to the math! The reduction: From Partition into Paths of Length 2. We’re given a graph G that needs to be partitioned into paths of length 2. Recall that a path of length 2 has exactly 3 vertices, and that an instance of this problem promises that the number of vertices is a multiple of 3. We’ll use the same graph for our Bounded Component Spanning Forest instance, and set K=|V|/3, give each vertex weight 1, and set B=3. Now, each set of our partition has to be connected and have exactly 3 vertices, which is the same as having a path of length 2.